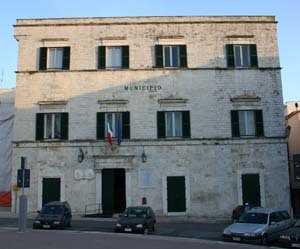 This Renaissance building holds a lithographs’ collection by Domenico Cantatore, a well-known painter of Ruvo di Puglia. In this palace, very interesting is the entrance hall. In the atrium of this Renaissance building it is possible to admire the sublime artistic value of a balustrade of ‘500, characterised by a representation with a bas-relief with seven mythological scenes, inscribed in other panels. It is the current town hall. 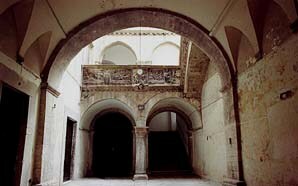 This palace is situated in the square where there is the Castle’s Tower, the last piece of defensive system of Ruvo di Puglia.